How many seed words does it use? Coldcard always generates 24-word BIP39 seeds. It can also import 12, 18 and 24-word, BIP39 seeds that other wallets may have created. Can I have multiple wallets in each Coldcard? There is a primary and secondary wallet. Each would typically have it's own master key from different seed words. In addition, we have a "duress" wallet for each of those wallets, but they are derived from the correspond wallet's seed words and are not independent. By adding a BIP39 passphrase you can unlock additional wallets which derive from the same 24 seed words. Yes, the PIN can be changed at any time and is independent of the funds being held. BIP39 passphrases cannot be changed because the text of the passphrase is part of the private keys. What blockchains do you support? Bitcoin and Bitcoin Testnet are recommended. We support Litecoin, but there may not yet be a desktop wallet to accompany that. Coldcard does not support altcoins at this time. Coldcard requires a desktop or mobile wallet to manage your coins and speak to the public blockchain. Although we can add support for other coins, they must have suitable wallet support already. Why does it have a MicroSD slot? The Coldcard can backup the seed into an encrypted file. New transactions to be signed, can be imported from the card. Public key data (xpub, receive addresses) can be written onto the card. Firmware upgrades can be done by copying the new firmware file onto a card. A skeleton Electrum wallet can be created on the card which allows Electrum to "pair" with the Coldcard, without it ever connecting to a USB port. How do I connect to a computer? Use the USB port at the top of the Coldcard. You must provide a standard MicroUSB cable suitable for your computer. Coldcard does not enable the USB port until a correct PIN code is entered so it will not appear on your computer until the PIN is entered. There is no need to use the USB port (except for power) during seed setup and when using the MicroSD card slot itself. We use the Coldcard with USB battery packs routinely, although some battery packs do not correctly detect the Coldcard because it uses very little power. They may power down because it appears that nothing is connected. Most simple battery packs and wall chargers are fine. PSBT is an emerging standard for "Partially Signed Bitcoin Transactions" and is described by BIP 174. Coldcard is the first "PSBT Native" hardware wallet. It uses PSBT internally, and should be able to sign most PSBT files generated by conforming software. For completed transactions, we can output either a PSBT (with the new signatures added) or a finalized Bitcoin transaction, ready to send. Bitcoin Core has recently added HWI which supports uploading unsigned PSBT files, and receiving signed PSBT files back from the Coldcard. All the features of the Coldcard, including message signing and showing of addresses are already supported in HWI. This is a great way to use your Coldcard from the CLI over USB connection. Insert a MicroSD card, and go to Advanced > Backups > Backup System. You'll be shown a 12-word password to be recorded, and have to pass a short quiz to prove you did that. Then the file is saved as an AES-encrypted 7Z file on the MicroSD card. We suggest keeping the password and file in different locations. The backup file is useless without the 12-word passphrase. Each backup will have a different backup phrase, and it has no relationship with the wallet seed words. Backups can also be verified (checked for completeness) from the menu system. Read more in our docs about backups. Can Coldcard import an encrypted BIP39 seed phrase? Yes! As of version 2.0.0, the Coldcard supports BIP39 passphrases. This unlocks approximately 5.9e197 more wallets based on your seed phrase. There isn't a factory reset due to the secure element. Most of the fields in that chip cannot be quickly reset. However, you can clear the wallet seeds and remove secondary PIN code individually. It's a lot of typing and all corresponding PIN codes must be already known to you. How do I know desktop software is showing a payment address that truly is a deposit into this Coldcard? 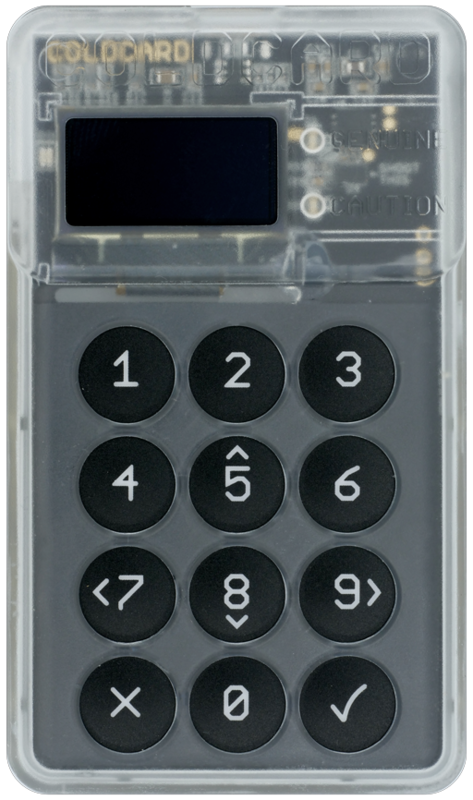 Coldcard can display the payment address after it has independently calculated what it should be. Without this, it would be hard to make a "deposit" into the wallet of the Coldcard without the possibility of someone misleading you. In Electrum, click on the "eye" icon shown near the payment address. Check the value shown on the Coldcard screen, compared to the value Electrum is showing. This 'show address' feature is typically used online, with the Coldcard connected on USB, but to achieve a similar result off-line, for the first five payment addresses, proceed as follows: insert a MicroSD card into the Coldcard, and choose: Advanced > MicroSD Card > Dump Summary. This builds a text file on the MicroSD card, with your root XPUB, and the XPUB and first five payment addresses for a number of different wallets' derivation schemes, and configurations. I found a previously-used Coldcard online, should I buy it? You should never buy a "used" Coldcard from EBay or another online store. A new Coldcard from the factory would arrive sealed in a special tamper-evident bag. That's an important security feature since it's possible to change the firmware on the Coldcard. It's impossible to trust what you're receiving from the second-hand vendor. All legitimate resellers should be providing the Coldcard unused and still in it's original tamper-evident bag. As part of the first-use sequence, you will verify the bag number matches the factory bag number. This random MicroSD card doesn't work? There are so many MicroSD cards out there, it's not possible for us to test with them all. We have tested with all the cards we can find locally, and a few ultra-cheap ones from Aliexpress. Still there will be some that won't work. If it's formatted as FAT32 and works on your computer, it should work. Please try another brand of card and if that fails, try one of our SLC cards, available in our store. Do you support Segwit (Segregated Witness) on the Coldcard? Yes. We have comprehensive segwit support, and strongly recommend it, but do not require it. We will display Bech32 and P2SH (segwit wrapped) addresses appropriately. The limiting factor is usually the wallet software generating the PSBT files for Coldcard to sign, and the BIP32 key derivation paths involved. For the Electrum wallet, we generate a PSBT file which will result in Coldcard producing a segwit transaction every time (this does not relate to use of Bech32 or P2SH addresses, just the transaction's signatures). Segwit is preferred since the cryptographic signature will cover exactly the payment details that the user has previewed on the Coldcard screen. In order to (safely) produce a non-segwit transaction, the Coldcard must be provided enough data in the PSBT to completely verify the inputs and since a full copy of the transaction for all UTXO inputs is needed, the result is a much larger PSBT file. Coldcard will refuse to sign a PSBT file where it does not have complete information on all inputs. At some point in the future, we may even block non-segwit signatures on the Coldcard, or make it disabled by default. Copyright © 2018 Coinkite Inc. All rights reserved.